What do wine writers say when they walk away….?! May we introduce Ryan O’Hara?! Mr. O’Hara is a Washington D.C.-based wine blogger, whose blog The Fermented Fruit reaches over 35,000 unique visitors each month. We thought Ryan’s perspective on how wineries present themselves would be valuable for SWIG readers. Please enjoy. What’s the weirdest or most unprofessional thing that a winery said or did while you were visiting? Awkwardly being pressured to purchase wine. While I realize that wineries are in the business of selling wine, I am there in a journalist capacity – not necessarily as a customer. While I do occasionally buy wine on these ‘official visits,’ I am certainly not in a position to do so every time. Expecting me to write about them and buy wine seems pretty one-sided to me. Unlike a traditional journalist, most bloggers aren’t being compensated for their time or articles despite having increasing influence amongst consumers. Being surprised to learn that a winemaker was genuinely interested in my blog. Usually I get the requisite ‘About Me’ scan before a visit. 3. What surprises you as you visit wineries, again, knowing that your hosts know you’re a blogger? Probably the disparity in how I’m received as a blogger. However awkward, some wineries literally roll out the red carpet while others don’t even seem to fully grasp the concept of blogging itself and the relevance of new media. Basically they don’t understand what a blogger is/does and or how it might relate to or benefit them. I think there is this stigma out there that many bloggers are just out to get free wine. While the opportunity to taste your wines is greatly appreciated the reality is that well-known bloggers already get more wine sent to them than they can taste. For those of us who invest a great deal of time and energy into our blogs, that viewpoint is quite frustrating. It’s important to note that having a big social media following does not necessarily translate to a lot of blog traffic. You can get an idea of how much traffic a blog actually has by utilizing Alexa.com. 4. What would be your advice for a winery when they are planning a visit by a journalist (do this, don’t do that)? It’s always a good idea to know who is visiting you, even if that means just a quick scan of their About Me page. No offense to hardworking tasting room professionals (several friends of mine!) but if it is possible have the owner, winemaker, or marketing director host journalists. What’s with the 10am tastings?! I realize that the argument is that your palate is most fresh, but I’d like to start a movement towards late afternoon/evening tastings! Also, please also make sure to provide a spittoon. Make sure that you’re on social media. I’m surprised how many great producers I visit who aren’t engaging consumers and fans on Twitter, Instagram and Facebook. Many bloggers will share something from their visit on social media. Some of the benefit is certainly lost if they can’t directly link to you. While most bloggers appreciate seeing the property, try to focus on what makes you different from other wineries. Know that we sincerely appreciate your hospitality. Should a blogger write about you – say thank you and keep in touch. 5. What motivated you to start your blog? Do you have any future plans for the blog? I needed an outlet to share my passion for wine. I think my friends and family had enough of listening to me going on and on about the wines I was excited about! I can’t say I have any future plans for the blog necessarily, though that could always change. I just recently added a ‘Cult Wine’ section where I will be sharing splurge worthy wines that I think have already achieved cult status, or may have what it takes to do so in the near future. I hope to develop that further and continue to develop good content for my readers. 6. Can you tell us anything about the readership of the blog? My readers are a diverse and loyal bunch. While 92% of the 32,500 unique users who visited in October were from the United States, the remaining 8% was represented by another 106 countries. The majority of my traffic finds me via organic search. While some blogs focus on wines from a specific price point, I prefer to cover wines spanning the price spectrum – which more accurately represents my interests in wine and how I consume it. It also enables me to connect with novice wine-lovers and connoisseurs alike. 7. What is your view of the current state of wine writing and journalism in the U.S.? I see the reliance on scores by prominent critics becoming less and less important as the millennial generation becomes a more and more powerful segment of the wine consumer population. They value a more personal connection and for better or worse, they buy wine more often based on its story rather than its actual quality. Their skepticism of the established system combined with their reliance on social media will support the current trend towards the increasing influence of new media. 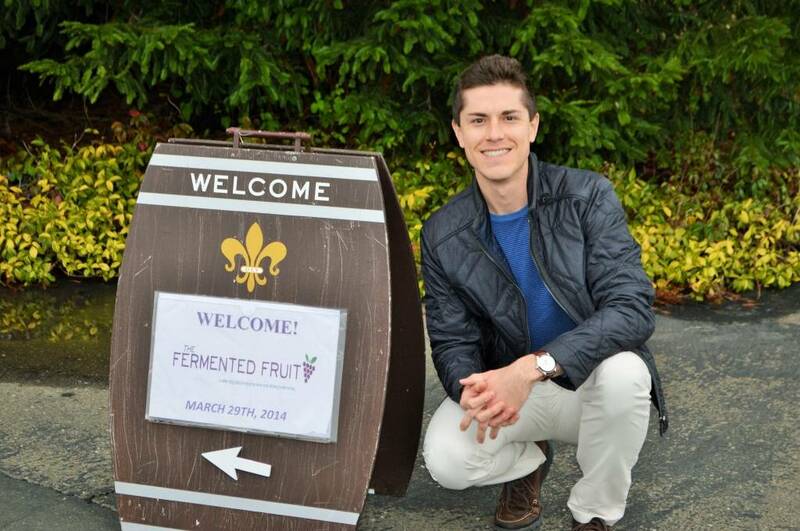 This entry was posted in Marketing and tagged TheFermentedFruit by Julie Ann Kodmur. Bookmark the permalink. Ryan is a great writer and a gracious guest – a true #winelover. We enjoyed his visit with us earlier this year and wish Ryan & his whole family all the best. I love what bloggers bring to the industry (it’s about time “power” to influence has been taken out of the hands of a handful of conventional print publications! ), and enjoyed reading about Mr. O’Hara. My one bit of advice, as (I admit) a conventional print publication wine journalist since 1981: Ryan, you should seriously consider bending to winemaker and winegrower hours, rather than asking “what’s up with 10 AM tastings?” These guys are normally up by about 5 AM, and at work by 6 or 7 AM. Yes, they maintain “farmers hours,” but if you really want them to respect and identify with you, you should be open to meetings as early as 8 or 8:30 AM. If you do this, I think you’ll be surprised by the improved receptions. Early bird, so to speak, gets the worm — something that holds true for journalists as well. Listen to what Randy says, he is helping you understand the differences that will identify you as a professional rather than just another self-important moocher. Not only does a professional respect his host’s work schedule, he respects his own physiology and schedules tastings when his senses of taste, smell, and sight are at their best—which is of course, about 10 a.m. Echoing Randy’s comment about your preferred hours. Wineries are busy places. If you can’t start as early as 8AM if that works for the winery, then you are missing the point of what your job is. Another thing, tasting 10 wines together? that may be one of three or four appointments in a day beginning at 9 and ending at 6. And not taking notes when you taste? What exactly is the purpose of a visit with a proprietor or a winemaker if not taking notes?